With advances in technology, students now have a choice of ‘learning places’ for lectures that enables them to "be connected to a community of learners anytime and anywhere without being time, place or situation bound" (Garrison & Kanuka, 2004). In our blended learning environment at the University of Tasmania, Bioscience students have the opportunity to choose their ‘place’ of lectures on an ad hoc basis – in the lecture theatre, online via synchronous web casts or asynchronous MyLO Media recordings or via podcasts – but the quality and equity of the learning experience across these modes is unclear. In this research we sought to understand why students make the choices they do about where they learn. Students enrolled in a first year bioscience unit across four geographically dispersed campuses responded to an anonymous online survey which included both qualitative and quantitative items. 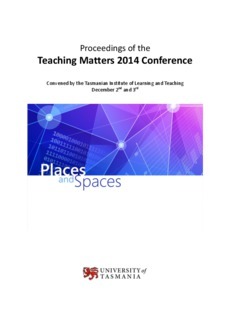 This paper reports demographic factors that, for the 124 respondents, are associated with mode usage and explores the thinking of students around their choice of lecture ‘place’, identifying key themes. The data indicate that the lecture theatre is the preferred ‘place of learning’ for most, with online modes viewed primarily as a supplement to, or occasional replacement for, the face-to-face experience. In their qualitative responses, students identified both pedagogical and pragmatic factors that influenced their choices. The findings provide a challenge to us to ensure that the elements that students value most in the lecture theatre are enhanced and are also available to those who choose to engage via another mode, to meet the demands for increased choice and flexibility but also to ensure equity and quality in the learning ‘places’ that we provide.